I've thought and tried to express this before but Stuart puts it in a much nicer way. We know that Mozart "made stuff up" all the time, improvising and inventing, trying new ways to play a tune every time he touched an instrument. Yet today there are traditional interpretations that "freeze" a particular performance as "perfect" and must be copied as accurately as possible. How sad Wolfgang would have been. Recordings have made possible the wide dissemination of marvelous musical works performed by the greatest players in history. Today, we can hear Glenn Gould’s Goldberg Variations (either one) or Oscar Peterson’s improvisations any time we like—and we can do this at home, or in our cars, or while jogging in a park. In what other age has so much rich musical heritage been so available? Still, this bounty comes at a price. In some ways recordings have had a negative impact on the art of piano-playing. Some of this has been an unavoidable consequence of freezing a moment in musical time—of bestowing stultifying permanence on an art form that, to stay alive, must breathe, dance, surprise itself, and, yes, even stumble. Because of recordings we have come to adopt a perverse view of musical performance as something disembodied—absent the physical presence of the artist—and comprising merely discrete quantifiable elements, like sets of pitches, articulations and dynamics. In this we lose sight of many essentials: the theatricality of a performance, the interrelationship of artist and listener, the full experience of spontaneous, unbridled creativity. A performance should be unpredictable—an adventure. Today we often demand instead that an interpretation be unblemished, “correct”—something to be memorialized and imitated. (Those of us who teach can attest to the number of students who see their job as learning to duplicate exactly a particular recording of a work by a recognized artist.) This has produced false expectations that haven’t served audiences or artists very well. It is interesting to consider that a century ago, wrong notes were often looked on with favor. Pianist Claudio Arrau reported that early audiences regarded them as a sign of genius—of giving oneself entirely up to the muses, with a resultant loss of control. Even memory slips were thought acceptable. Conductor Sir Thomas Beecham recounted a Beethoven concerto performance he gave with pianist Alfred Cortot, whose slips were notorious. “We started with the Beethoven, and I kept up with Cortot through the Grieg, Schumann, Bach and Tchaikovsky,” he reported, recounting his struggle to follow the errant pianist who was landing on all sorts of other pieces while desperately attempting to regain his place in the score. “And then he hit on one I didn’t know, so I stopped dead.” Wouldn’t it be worth having a recording of that? The pervasive editing used today—the extensive slicing and dicing in an attempt to find perfection—can also rob a piece of the organic quality of a live performance, where one phrase logically leads to another. Many of us know of recordings—even by jazz artists, where spontaneity purportedly rules—with thousands of edits, with a result that is horribly unnatural. The history of recording tells us that serious distortions were present from the beginning. Consider, for example, the influence of piano rolls on the playing of Art Tatum, a jazz artist who was known for dazzling technical feats. As a youngster listening to various rolls in the early years of the 20th century, he was unaware that they could be edited, and that often, after a roll had been cut, editors punched additional holes to make the musical texture fuller and more complex. Tatum played as if he had three hands because the piano rolls he heard sounded as if they were made by three hands, and he thought that was the normal way to play. In this instance, the deception led to great things. But it hasn’t always. The sound of the recorded piano will unavoidably be at a remove from what audiences in a natural setting might expect. In the earliest days of recording, dynamic shading was impossible—and because of the primitiveness of the technology involved, sometimes the worst piano actually worked best. Pianist Gerald Moore, recounting his first recording experiences, revealed that he was instructed to play with unvarying dynamics and loudly. Later Moore expressed shock at what he considered an excess of “passionate fervor” in some of Ignacy Jan Paderewski’s recordings and concluded that Paderewski must have been forced to play with a “consistently penetrating forte” in order to record successfully. But Paderewski was also a product of the “grand style,” which favored the kind of largeness of expression that is no longer considered proper. A wholesale shift in aesthetics was responsible—a shift in keeping with the sensibility that comes with recording technology. 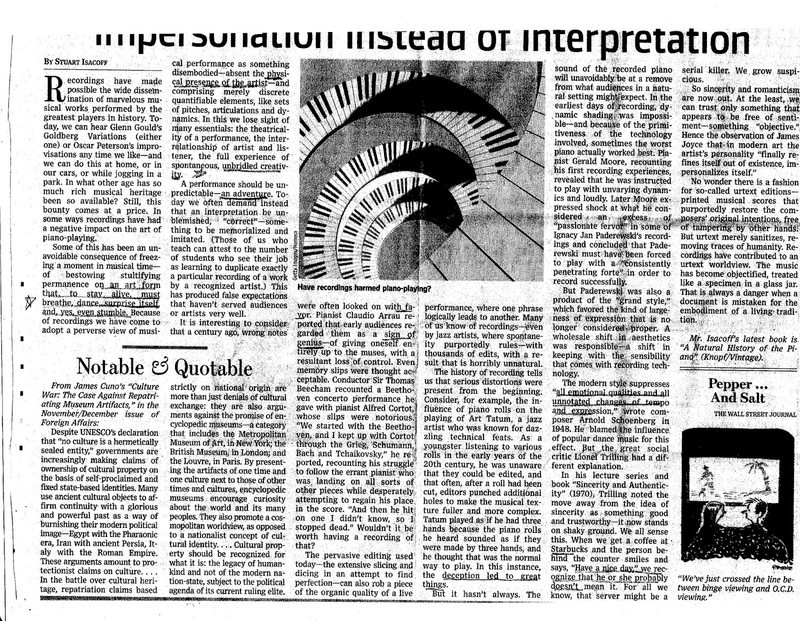 The modern style suppresses “all emotional qualities and all unnotated changes of tempo and expression,” wrote composer Arnold Schoenberg in 1948. He blamed the influence of popular dance music for this effect. But the great social critic Lionel Trilling had a different explanation. In his lecture series and book “Sincerity and Authenticity” (1970), Trilling noted the move away from the idea of sincerity as something good and trustworthy—it now stands on shaky ground. We all sense this. When we get a coffee at Starbucks and the person behind the counter smiles and says, “Have a nice day,” we recognize that he or she probably doesn’t mean it. For all we know, that server might be a serial killer. We grow suspicious. No wonder there is a fashion for so-called urtext editions—printed musical scores that purportedly restore the composers’ original intentions, free of tampering by other hands. But urtext merely sanitizes, removing traces of humanity. Recordings have contributed to an urtext worldview. The music has become objectified, treated like a specimen in a glass jar. That is always a danger when a document is mistaken for the embodiment of a living tradition.